When I was pregnant with my first son I dreamed of decorating cookies for the holidays like I did with my mom and grandma. It is always a good time when frosting and sprinkles are involved. Finally the time came for me to do it with my own kiddos. But as luck would have it every single sugar cookie recipe I tried was a bust. Disgusting. Horrible. Inedible. They all turned out tasteless, too crispy, burnt, and uneven. It almost made me want to give up on the whole thing. Almost. After testing almost a dozen recipes over a few years I finally found one I liked and could make well. Now I could finally bring cookies instead of cupcakes to this years cookie exchange (yes, I totally did that for several years cause this mama can make a cupcake). So without further adieu, my favorite sugar cookie recipe is here! Combine the dry ingredients. Cream the sugar and butter. Add the egg and extracts and mix then bit by bit add the flour mix until it’s all combined. Make sure to get what’s at the bottom! The dough will be crumbly, so knead it together with your hands. After the dough is done kneading separate into 4 pieces. On a floured surface roll and cut into your shapes. Line a baking sheet with parchment paper and bake for 10-12 minutes. After it’s done cooking pull it out and let it sit for a few minutes before placing on a cooling rack. 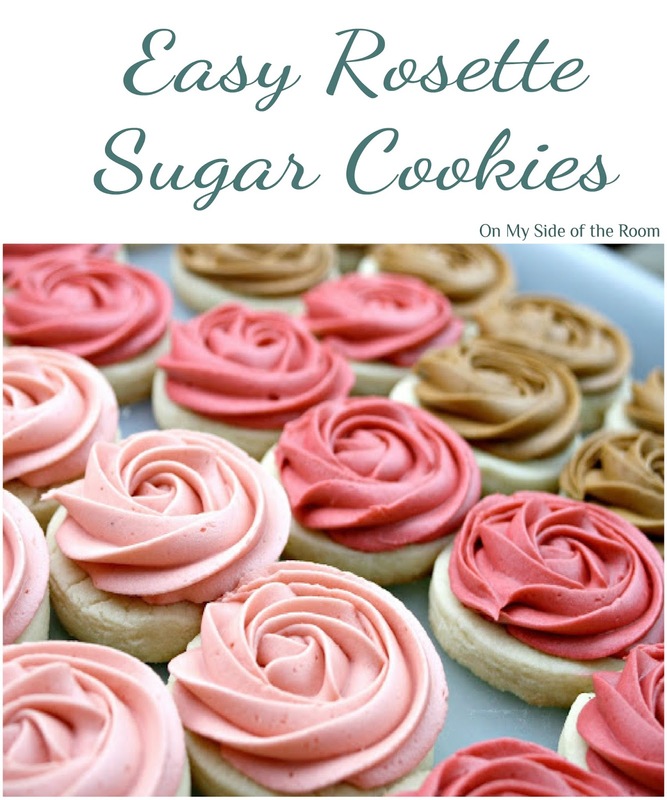 These Rosette cookies are really easy to make. These particular ones I made for a friends baby shower, it was a girl cowboy theme. I used buttercream frosting. Normally I just eyeball it but here’s a copy for anyone who wants to know where I originally got it. Add vanilla and cream and continue to beat on medium speed for 1 minute more, adding more cream if needed for spreading consistency. If you don’t have cream I use homogonized milk if I have it or regular milk. I just don’t carry cream on a normal day! For the coloring, I used wilton gel, a pink that I had on hand but it was a little too bright so I added a bit of brown to give it more of a rustic look. Then I lightened part of the darker frosting up to have the two different shades of pink and then did a brown. It was the perfect color combo for the little cowgirl to be. The flowers might look complicated but if you have the right tools it’s a breeze. I used a large star tip but you can use whatever one you have on hand. Then start in the center and swirl out until you hit the outside edge. I am Baker has a great tutorial and is what I used to learn when I did the flower cake for my sister. Cute! They look yummy too. I tried these out tonight – loved them! Thanks for the great recipe! I made the frosting last night. I usually make my own but wanted to try something new. I am glad I did. The frosting is amazing! My only problem was my butter wasn't quit soft enough so I ended up added a little evaporated milk to the frosting because the whipping cream just continued to make it thicker but I know if I didn't live in North East PA where the temp is freezing right now, I wouldn't have had to use the evaporated milk. Thanks so much!! Those are so pretty! I love cookies so much. I cannot wait to try this recipe! I totally thought the rosettes were out of my league. Glad to know they are just all about having the right tools! They are SO not out of your league. It really is just about the tools. Get that set and it will make every cake and cupcake you make look like a professional did it. It is seriously just a circle swirl. I have to laugh when people compliment them because they are just a swirl. Hope you have fun trying it! I think those cookies look delicous. I am a big fan of rose. They are one of my favorite flowers. I never thought of making them on a cookie out of icing. I didn’t for a while either. I’ve done the rose flower on a cupcake but when I had to decorate some cookies really fast the idea of using a butter knife to spread frosting on just seemed like it would take forever so I did this and it was so fast, easy and beautiful. So cute and pretty! The frosting look beautiful, and I bet the taste is delicious. I like how simple this recipe is. It is so easy! I remember thinking it looked to hard but then I tried it and it turned out great. Then the sugar cookie is my favorite. I had almost given up on ever making sugar cookies which is sad because I have so many memories with my grandma making them. Now I can make them with my own boys. Thank you so much for stopping by! Those are gorgeous! How perfect they would be for a bridal shower or a spring party. Almost too pretty to eat! These are absolutely beautiful. Pinning for later. My teen’s nickname is Rosie. Love it! They are seriously so easy to make but for some reason look complicated. It’s just a swirl and about having a good frosting tip. That’s really all you need. You make it look so simple but I know if I tried to make it it would look no way near as perfect as yours. These look heavenly! These cookies are so beautiful, but they look like something I could actually do! I can’t wait to try! Do it! You will thank me. The almond flavoring really makes them taste amazing. Thank you for stopping by! Oh wow, how beautiful! And with buttercream frosting, I know they have to taste good! i love those sweet Rosette’s! So pretty! I need to try these…and I don’t normally like cookies without chocolate! Me neither, I’m definitely a chocolate lover but trust me these are really good and you’l love them! Spectacularly innovative and beautiful! Looks hard for me to make but so creative ! Reminds me of edible arrangements! Those are beautiful! I haven’t made sugar cookies in forever! I need to try out my decorating skills! Thank you! With the right frosting tip it is seriously just a circle. So simple and if I can do it anyone can! Thank you for stopping by! Oh my god these are so cute! And they seem so delicious, my sister would love them. My kids would love these. They’re almost too pretty to eat. Love the colors. Could these look anymore yummy? They are so pretty and feminine too! It was fun and easy to make. I don’t ever get to make pink things being the only girl in a house of 4 boys. I’m totally outnumbered! Oh my these look so good. I’ve never tried doing sugar cookies with frosting but can totally do this with cupcakes. These look delicious! I am not great at any type of cake/cookie decorating, but I aspire to be! I might have to give this a go! These are lovely cookies. I could never replicate the frosting. I’m just not that talented LOL. Thank you! It is by far one of my favorite dessert recipes and we use it a lot. Thank you for stopping by! These look so tasty. I am looking forward to get past my fears and trying it. Frosting is not my forte! It’s all about confidence! Seriously I remember I was the same way with frosting but then I saw my mother in law do it and it helped me overcome. Just whip the heck out of it, add sugar or milk if it needs it. Good luck and thanks for stopping by! Your cookies look stunning. I’ve never seen a rosette style icing on a cookie before, and I just love it! Thank you! They are the best recipe ever if I do say so myself. After trying so many I finally tweaked it enough until it was perfect. Thanks for stopping by! I love baking and decorating! It’s so fun and relaxing. Thank you for the beautiful photos. Definitely pinning! We love to bake to and I was so sad when all the recipes I had for sugar cookies just weren’t good. So I tweaked and played around with it and found this! Thanks for stopping by! My sisters middle name is Rose! I did a rose cake for her for her birthday (basically just a regular cake with all the flowers) it was so easy and everyone thought it was hard. It totally isn’t. If you can draw a swirl you can do it! Those are simply beautiful! I seldom bake cookies, but I’ll definitely have to bake these cookies sometime. We actually don’t do cookies a ton, mostly to decorate for Christmas or other holidays. I always remember doing intricate designs as a kid with my grandma. I would always take forever making sure the sprinkles were just right while all the other kids ran off to play. I just always wanted to do that with my boys and I’m glad I figured this recipe out for when we do use it. They love decorating them. Not as much as I did but close! These are so cute! I wish I could make them come out like that lol. This would be perfect for Mothers Day gifts, or to talk to a mother daughter lunch/tea. Omg these cookies are almost to pretty to eat 😉 I so need these in my life! So chic!